If the winter blast isn’t enough motivation to travel to Mexico, maybe Double AAdvantage Miles will make you think again. American Airlines is offering Double AAdvantage Miles for travel between Dallas/Ft. Worth and Santiago de Queretaro in central Mexico and for flights between DFW and the seaside resort city of Veracruz, Mexico. Santiago de Queretaro is the capital city of the Mexican State of Queretaro, a UN World Heritage Site founded in 1531, and the modern economic center of a fast growing region about 150 miles northwest of Mexico City. 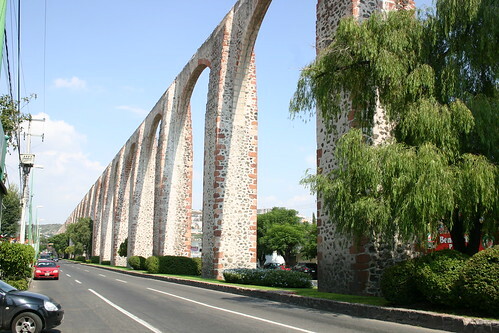 In addition to having 80 degree temperatures, Queretaro is steeped in history: it’s the birthplace of Mexican Independence, it was the site of the Emperor Maximilian’s trial, and it boast a nearly mile-long aqueduct that was constructed 274 years ago. It’s also an important commercial and industrial city, resembling any modern suburban U.S. business city. A large middle class, excellent infrastructure, and a very low crime rate make Quertaro a very attractive city to do business: it’s home to both aerospace and electronics manufacturing, technical support call centers servicing latin American, and it’s also home to several insurance and banking operations. And Veracruz is, well, Veracruz: beaches, warm weather (though with some high winds this time of year), resorts and a famous nightlife. Offer: Starting February 10, 2011, American Eagle will offer the only nonstop flights between Dallas/Fort Worth and Queretaro, Mexico. To celebrate, you can earn double miles every time you fly our new route through April 30, 2011. Offer: Starting February 10, 2011, American Eagle will offer the only nonstop flights between Dallas/Fort Worth, and Veracruz, Mexico. To celebrate, you can earn double miles every time you fly our new route through April 30, 2011. Both offers require you go register before you travel. Go here to register.